Six Sigma is a quality improvement philosophy and methodology that has been used successfully in improving the operations of organizations worldwide. Leading organizations including FIAT, Magna, Starwood Hotels, ITT Lavoro, GE, Boeing, Delta Airlines, Raytheon, IBM, Motorola, Lexus, and Allied Systems, as well as numerous smaller companies in Europe, North America, and Asia have successfully utilized the Six Sigma methodology to improve their internal operations as well as supplier performance. Using Sig Sigma methodology results in increased product and service quality, increased speed to market and increased product value. CIMBA has embraced Six Sigma in an effort both to provide students with an experiential learning opportunity focusing on business process and problem solving and to provide its client companies with a unique opportunity to understand and evaluate the Six Sigma methodology. Consistent with CIMBA’s educational philosophy, the managerial methodology of Six Sigma expressly recognizes the importance of customer-centered, data-driven decision-making. It is being used profitably in virtually every industry around the world, and by both large and small companies within those industries. Importantly, the methodology is well rooted in mathematics and statistics. 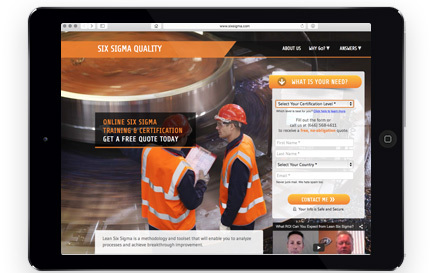 The Six Sigma workshop is a measurement-based management strategy that uses tools and techniques from Total Quality Management. It focuses on quality initiatives for analyzing the root cause of a business process problem (whether in production, marketing, sales, design, etc.) and then analyzing and improving the process. Once the process is producing as few defects as possible, Six Sigma requires that appropriate controls be put into place to continually monitor the improved process and ensure that the cost savings realized continue. The increase in performance brought about under this methodology leads to a vast improvement in product quality, customer satisfaction, employee morale, and business performance. Taught by a Master Black Belt, the Six Sigma workshop meets during the week, is four days in length, and is offered once per year. The class provides an additional opportunity for networking as executive program students and full-time MBA students participate in the training together. Following the workshop, you will participate in a hands-on Six Sigma project involving the local business community. The successful completion of the workshop and project leads to the achievement of Six Sigma Green Belt certification. The Six Sigma short course costs 1500 Euros. Current Part-Time Students and all CIMBA alumni pay a discounted rate of 1000 Euros. To talk with a CIMBA staff member about our Sig-Sigma short course, contact us at executive@cimbaitaly.com or call +39-0423-932120.